We welcome communication from readers. We particularly encourage individuals, groups, historical societies, publishers to send us news and information (including press releases) about forthcoming events, publications, lectures, presentations in any way related to Irish History. Feel free to contact us. While we cannot guarantee that everything we receive will be published, we will strive to give as much coverage as is practicable. We reserve the right to edit any material that we receive for publication. Subscribe to this E-News service to receive periodic updates via e-mail. You can also follow us on Facebook, Twitter, Google Plus. 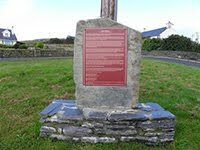 Brian Seery, a farm labourer and father of five, was executed on this day (13 February) in 1846, outside Mullingar Gaol, having been charged and found guilty of the attempted murder of Sir Francis Hopkins, a local landlord. This was in spite of what a contemporary observer (the author, Charles Dickens) described as, "extremely questionable evidence and his own persistent protestations of innocence." The occasion of Brian Seery's murder by execution (which took place 173 years ago today) is marked by the publication of a new book by author and investigative historian, Jack Kiernan. 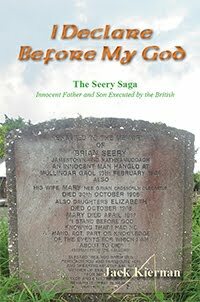 However, I Declare Before My God: The Brian and James Seery Story deals with not one but two 19th century miscarriages of justice, in Ireland and Australia, resulting in the deaths of a father and a son, both sentenced to hang but, in separate circumstances, 24 years apart and even on different continents. When Brian Seery died, he left behind a wife and a young family, including a son, James, later to be sentenced to death in Australia, where he had moved to find work in the goldfields of the Gippsland region of Victoria. Charged and found guilty of the murder and mutilation of a body, he was sentenced to hang and executed on 14 November 1870, aged just 33 years. James Seery, like his father before him, was sent to an early grave under very questionable circumstances. In the view of author, Jack Kiernan, in the Ireland or Australia of today, neither case would get into court. Once again, Jack Kiernan carefully assembles the available evidence in a manner that lets the reader decide while, at the same time, leaving no doubt as to how he views the circumstances and the judgements that were handed down. He also offers a stinging critique of colonial attitudes and Ascendancy mindsets that resulted in many such travesties of justice. I Declare Before My God: The Brian and James Seery Story is published by The Manuscript Publisher and on sale now. RRP €19.99 plus P&P. 20.00 pm: Who Fears to Speak of '22? The politics of Commemoration. The practicalities and challenges of commemoration history; a panel discussion and public forum with historians and the local media. The Saturday night programme will feature a performance of The Birth of a Nation concert, which was last performed in Lexington, Kentucky as part of the Twinning anniversary there in October. 20.00 pm: Saturday, 9 June: Birth of a Nation a musical extravaganza set against the backdrop of Irish history up to the founding of the modern Irish State; featuring songs and music from the period. A marvellous, sometimes whimsical, but often tragic journey, guaranteed to move and entertain. Script by Mario Corrigan. Paul Linehan, Tenor; Ann Cullen, Piano and Violin, and Liam Quinlivan, Narrator. Admission €10. Friday – Free; Saturday – €5.00. Includes complimentary tea and coffee break. Lunch at own expense. Booking essential via Riverbank Arts Centre Box Office. 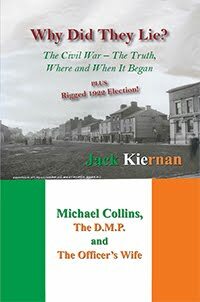 On this day (25 April) in 1922, gun battles took place on the streets of the Irish midlands town of Mullingar that a new book by author Jack Kiernan contends, mark the beginning of the Irish Civil War (1922-23). His recently published Why Did They Lie? uncovers shadowy events that took place, shedding important light on the very origins of that conflict, where and when it all began. He also offers an assessment that challenges certain assumptions about the course of events, the personalities and leadership dynamics involved in a conflict that itself took place against the backdrop of a very turbulent period of Irish history. Most people, with any knowledge of Irish history, know that hostilities in the Irish Civil War commenced with the move by the Provisional Government to take the Four Courts in Dublin (held by anti-Treaty forces), towards the end of June 1922. Most people would be wrong, however! That is the view of Jack Kiernan, who sets out to investigate the roots of a tragic and bitter conflict, that proceeded apace with the emergence of independent Irish statehood. Growing up in an Irish Midlands town, Kiernan remembers being told by his teachers that "if anything of importance happened in Mullingar, it would have been recorded." Bullet holes remnants in the walls of prominent local buildings seemed to give lie to these bland assertions, as did the recollections of older neighbours, alluding to "the shooting of unarmed prisoners during the Civil War." What he only discovered, much later, was that events of, not just local but national significance had taken place in the town where he grew up. What's more, they had been recorded, only to be buried deep within the archives – almost as if they had been deliberately covered up! The evidence that he reveals here, confirms that open hostilities between pro- and anti-treaty forces were already in place throughout the country early in 1922 and prior to the events in Dublin. Furthermore, gun battles took place in the town of Mullingar during the month of April 1922, resulting in deaths (the first casualties of the Irish Civil War). Evidence also suggests that British forces, though officially withdrawn, may have fired the first shots. The events of the Irish Civil War (1922-1923) have cast a long shadow over Irish life. This book sheds important light on a dark chapter in Irish history; a contribution towards the debate that surely must accompany the centenaries of these events, which are now just around the corner. Why Did They Lie? by Jack Kiernan is published by The Manuscript Publisher and available to buy online, as well as from certain bookshops. For further information, visit the author's website. A new website dedicated to the life and work of the philosopher, John Toland (b. 1670), was launched last Sunday, 11 March (the anniversary of his death in 1722). John Toland was an Irish-born rationalist philosopher and freethinker of the early Enlightenment period. He made important contributions to the various fields of philosophy – in what today would be regarded as both the natural and social sciences. "If you would know more of him, search his writings," he wrote in a self-penned epitaph that appeared following his death. The purpose of of this web-based project, say the organisers, is to serve as a free, online resource and repository of knowledge pertaining to Toland, his writings, the times in which he lived and to the social movement that he, along with others, spearheaded and represented, with particular reference to the enduring legacy and effect. There is a lot that has been said about John Toland and probably a lot more that could be said. This web-based project will serve the purpose of ensuring that nothing that should be said will go unsaid. This is also why we are making the material posted to this website freely available and open to anyone who may wish to contribute. Furthermore, we invite those who may wish to contribute to get in touch with us. The unveiling of the website on the anniversary of Toland's death is not coincidental. In fact, the date has been deliberately chosen with an eye to the impending 350th anniversary of Toland's birth, which will be observed on 30 November 2020 and the 300th anniversary of his death falling less than two years later, in 2022. We particularly encourage anyone who has an interest in these anniversaries to get in touch with us, to ensure that they are properly observed and accorded the respect that they are due. We will do our best (without fear or favour) to publicise events that are taking place, using networks and channels of communication within our reach. John Toland (1670-1722) website is owned and managed by The Manuscript Publisher, an Irish-based publishing services provider who have published, or otherwise made available, several works by or relating to John Toland, including J.N. Duggan's short biography Ireland's Forgotten Philosopher, Scholar ... and Heretic. They go on to specify however that "this is not intended as an advertisement or an endorsement. Furthermore, we welcome correspondence from authors, publishers, educationalists, historical societies, groups and individuals who might see some aspect of their own interest or remit reflected in this initiative." Anyone with an interest in this web project is invited to keep in touch. If you would know more about it, visit the website. 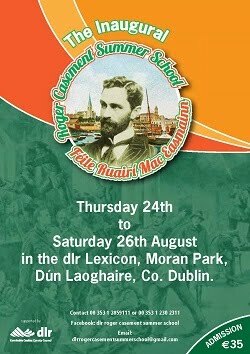 The inaugural Roger Casement Summer School/Féile Ruairí MacEasmain will be held in the dlr Lexicon, Moran Park, Dún Laoghaire, from Thursday 24th to Saturday 26th of August, 2017. The twin themes of the school are Roger Casement and His Times and Present Day Human Rights Issues, with speakers form Ireland, the Democratic Republic of the Congo and Peru, together with films and evenings of song, music and poetry. Roger Casement (1864-1916) was born and brought up as a child in Dún Laoghaire, and the dlr 1916 Committee, which had organised a series of lectures to commemorate the centenary of the Easter Rising of 1916, decided to seek to continue the link with 1916 by organising a school in honour of Casement. Dún Laoghaire-Rathdown County Council is sponsoring the school. A statue to Casement is to be erected in Dún Laoghaire next year. Further information about the summer school is available online, including from the website of Dún Laoghaire-Rathdown County Council as well as on Facebook. The programme of events is also available to download. Henry St George Smith (1813-1899), High Sheriff of Louth, built Piperstown House, Drogheda in 1842 (52 rooms – one for every week). Generations of the family occupied the house for 150 years. Brian and Jean Smith still live on the 365 acre estate (an acre for every day of the year), with their family, Paul, Robert and Victoria, where they run Piperstown Equestrian Centre: an impressive indoor and outdoor riding school, livery and cross country course. These historical documents were compiled and typed by Brian’s mother, Jennifer Ann Smith (1935-2007) and gifted to Brian so that future generations of the family would have a better understanding of their fascinating history and ancestors. The documents have now been made available online, for members of the public who may also be interested in this extensive catalogue of family history – see St. George Smith Piperstown History. Included are a family tree and genealogy, photos and facsimiles. In addition, "extensive reels of 8mm and 16mm film footage (home movies) of the St George Smith family at home at Piperstown over the years, have been archived and stored safely at Piperstown by Brian Smith, which is currently being converted to digital format and will be uploaded upon completion." Find Piperstown Equestrian Centre on Facebook. Follow on Twitter. These stills are from a 30-minute film, Ireland: Birth of a Nation, which "traces the key events that led to the Easter Rising, the Rebellion itself, and the subsequent War of Independence and Civil War." 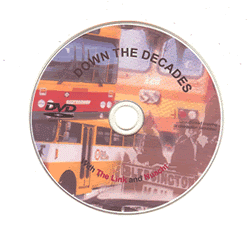 The film includes some of the oldest film footage ever shot in Ireland and many of the key personalities of this period are captured on camera. We witness Padraig Pearse delivering his famous oration over the graveside of O’Donovan Rossa, in a segment that also contains the only known footage of James Connolly. Other historical figures of the period include Roger Casement and Michael Collins. The film premièred last year at the Royal College of Physicians, close to St. Stephen's Green, a historic area of Dublin that featured prominently in the events of Easter Week. Indeed, footage from 1897 of O'Connell Street and St. Stephen's Green have been unearthed in putting together this film. "With the centenary of the 1916 Easter Rising approaching in 2016, this film is a must see for anyone with even the remotest interest in Irish History." according to the film's website. Ireland: Birth of a Nation will be available for school showings until March. See the film's website for more details.